Frequently Asked Questions for Canoeing in Scotland. Do I need to have previous canoeing/paddling experience? No. Whether novice or competent paddler, thorough, expert coaching at an appropriate level will be provided throughout the Journey. Can we have a distillery visit on our Classic Spey Descent/At One With Nature Spey Descent? Although you will sample several whiskies in your special tasting experience, distillery visits are exclusively arranged for ‘Spirit of the Spey’ Journeys. It may, however, be possible facilitate a distillery tour at extra cost and may require extending your stay. Can we be collected from Airports or Train stations? Yes, this can be arranged for you or you and there would be a supplementary charge for this service and that would reflect the distance being travelled. Alternatively you can use the contacts page to make this transfer arrangement yourself. Is it possible for children to come on any of the Descents? Yes, and it is my experience that children 12 or over can be integrated into a descent group when accompanied by a parent/guardian. Classic Spey Descents or At One With Nature Spey Descents would be suited to children and only over 18 year olds can partake in any whisky tasting experiences. What if some of our group don’t like whisky? Is there a discount? Each Journey option includes some sort of whisky experience and it is perfectly acceptable for participants to decline the whisky tasting invitation. In the case of ‘Spirit of the Spey’ Journeys there is a particular focus on Whisky history, production and the different processes involved. This in itself is very interesting even for non-whisky drinkers and no discount is given for those choosing not to taste the amber nectar. What happens if someone gets injured or cannot cope with the canoeing aspect of the journey? There are emergency contingency plans that can be put into action should this be needed. The participant/s involved may need to pay charges incurred in such unlikely incidents. Canoeing is an active outdoor pursuit and even with the greatest preparation and due care, accidents (although very infrequent) can happen. Current Personal Accident Insurance in place is advised. Can we just do the distillery tours and whisky tastings, without the canoeing? This may be possible and a personalised Whisky Experience itinerary created for you. Make e mail contact with Dave to highlight your preferences and we will take it from there. Can I mix and match Journeys? The journeys are designed to give a range of options with something to suit everyone’s aspirations and budget. Mixing and matching of journeys is not possible. However, additional experiences, for example a distillery tour or castle visit, could possibly be added if you wish to extend your stay and pay any additional expenses incurred. Can I bring my own canoe/associated equipment? Yes this is possible. However, any price variation for this would be very small. Canoe(s) requires to be fitted out with buoyancy end blocks/bags and also have a facility, such a snug end loops, for clipping into for rescue purposes, in the event of capsize or canoe jammed on a rock, etc., in fast water. Can fishing on the Spey be arranged? Not included in our carefully sculpted canoe journeys. 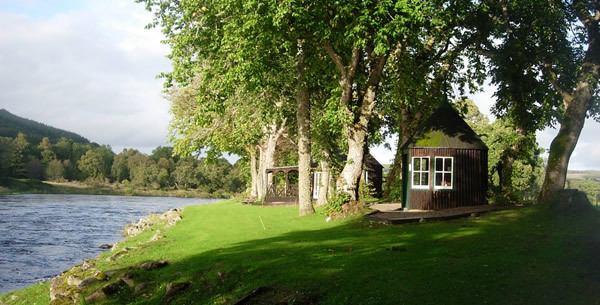 However, if clients can extend their stay in Strathspey it may be possible, with prior notice, to arrange fishing. We offer a flexible range of dates, simply let Dave know the best time for you and perhaps a Journey can be set up. We were blessed with four days of fantastic weather, blue skies, sunshine and warm breezes. The scenery was breath-taking, the pace leisurely and the company engaging. It was good to be in such capable hands - Dave provided excellent coaching with paddle techniques and instruction how to read the water ahead.